Love the idea of using Yogurt instead of many other “less healthy” options in recipes. It’s a simply swap out that really packs in nutrition. Have you tried baking with yogurt yet? I’ve been using it with scrambled eggs instead of milk to create the most marvelous fluffy eggs. Yum! Stonyfield tipped me off to the concept of using their yogurt when scrambling eggs this summer when attending the Walmart Shareholder’s meeting and devoured the most delicious egg burrito that had been made scrambling the eggs with yogurt. 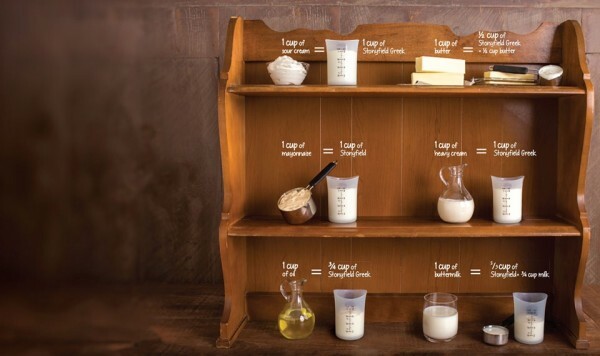 Here’s a link to the Yogurt Substitution Guide that Stonyfield created. Love these tips and swaps. Such a great way to cut calories and pack in extra nutrients into our own diets and our families diets. Tips to note: Freezing yogurt does not impact the active cultures, however if you bake with it, temps above 120 degrees will destory the cultures, however the heat does not damage the yogurt’s valuable nutrients like extra calcium and proteins.